Exclusive private tours, tailor-made to your requirements. Guided tours of the garden can give you a first-hand insight into its creation and upkeep. 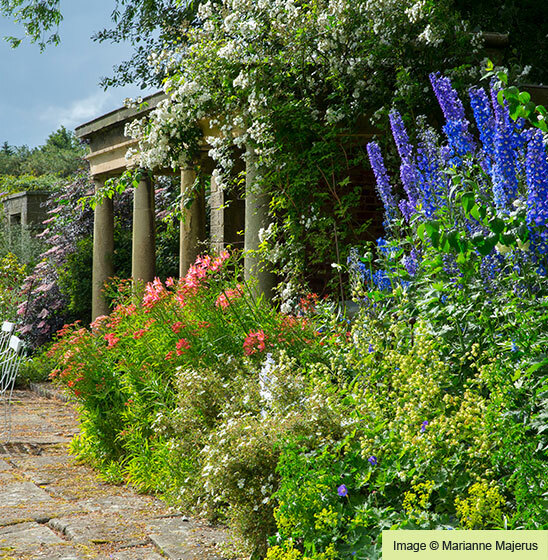 The garden and architectural features were designed by Sir Edwin Lutyens and strongly influenced by Gertrude Jekyll. The gardens are not open to the public so your private visit or tour will be exclusive and tailor-made to your requirements. Our delicious home-cooked lunches and cream teas are the perfect complement to your visit and can be enjoyed in the beautiful surroundings of the garden. Allow a minimum of 1 - 1.5 hours to make the most of your visit, longer if you would like to stay for refreshments. The gardens, in the unspoilt village of Whalton, is one of Northumberland's 'must-see' gems. In a vast county renowned for its diverse landscape, including beautiful golden beaches, magnificent valleys and wild heather moorland, Whalton's proximity to Scotland, Alnwick and Newcastle make it a central attraction to visitors to the North East. The gardens of Whalton Manor are open from April until October and prices will vary according to numbers. The gardens can be enjoyed by individuals or groups of up to 50 people and entry to the gardens start from £7.00 per person. Tours must be booked in advance. Free admission will be granted to coach drivers and tour operators. Please contact us to arrange your individual visit or group tour.